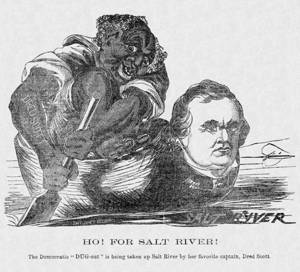 This cartoon from the Cincinnati Rail Splitter focuses on the burden that the Supreme Court’s Dred Scott ruling (1857) placed on Stephen Douglas’s presidential candidacy in 1860. Douglas argued that territorial voters should decide, without federal interference, whether to legalize slavery (“popular sovereignty”). In Dred Scott, the Supreme Court had ruled that slavery could not be banned from the territories, thereby blocking the possibility that territorial voters could outlaw the institution. The “Salt River” is a metaphor for political defeat or oblivion.